The novel “The House That Jack Built” by Guy Adams was published for the first time in 2009. When Gwen Cooper blocks a shoplifter during her shopping and the police intervene to arrest her, her old colleague Andy tells her about the strange death of a boy in the vicinity of an old house called Jackson Leaves, which seems to be tied to a peak of chronon energy similar but not the same as that coming from the Cardiff Rift. Captain Jack Harkness hired an alien who came to spend his retirement on Earth using the name Alexander Martin to work for Torchwood as a freelance doctor when they need someone to do the job Owen Harper used to do. The Jackson Leaves investigation brings to Jack’s mind old memories because in 1906 he became the house’s first owner. 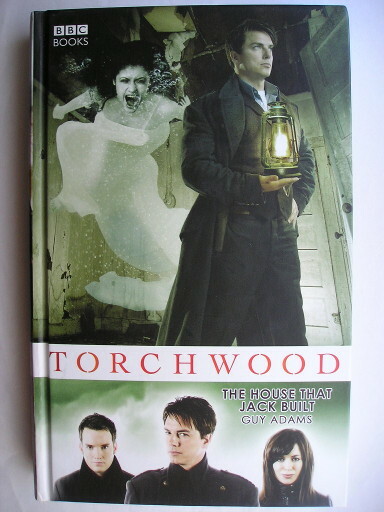 “The House That Jack Built” is part of a series of novels connected to the TV show “Torchwood“, a “Doctor Who” spinoff. The size is the same as “Doctor Who” books starting from the Eleventh Doctor. In the first books the font was smaller while in the following one the font is the same size as in “Doctor Who” books. Guy Adams uses the popular tradition of the haunted house as the basis of “The House That Jack Built” by adapting the elements drawn from that kind of legends to Torchwood’s fictional universe. This means that it tells events typical of that kind of stories that are however accompanied by (pseudo)scientific analysis Captain Jack Harkness’s team to understand the real nature of those events. Along with flashbacks into Jack’s past, this makes it a novel with all the typical characteristics of the Torchwood series. “The House That Jack Built” is set between the second season of the TV show and “Children of Earth”, when Captain Jack Harkness was left with only Ianto Jones and Gwen Cooper from his original team. For once he feels he needs another doctor and recruits a character who appeared in the previous novel of the series, “Bay of the Dead”, which I haven’t read so I don’t know if I missed something in this character’s development. It seems that Guy Adams had the task of reusing characters seen in previous novels because in “The House That Jack Built” Nina Rogers also appears and for her it’s the third appearance and not even the last. In her case, my problem is that I read some of the novels in which she appears but out of sequence and over a long period of time, so I didn’t remember her. The strange events connected to Jackson Leaves are intertwined with Captain Jack Harkness’s past. During the novel various moments are described in which Jack has fun with some lover, man or woman. These are definitely the parts of the story best suited to adult readers in a novel that is otherwise rather bland for the Torchwood series and can only impress someone with its horror connotations. In fact, my problem with “The House That Jack Built” is that it seemed too bland to me. At times I had the impression that Guy Adams was more concerned with adding to the novel elements typical of Torchwood’s stories, including characters that had already appeared, mixed with those of haunted houses stories than creating a strong plot that made the most of the protagonists and the other characters. The result has all the appearance of Torchwood, also for the ties with other stories, but its substance, meaning for example dramatic intensity, seemed to me a little lacking. The length doesn’t reach 240 pages so there was space to add some details, and even more, here and there to give the novel a little more depth. In the end I can’t even say that “The House That Jack Built” is bad but it really looks like a lighter version of the Torchwood I’m used to. It seems to me suitable for fans of the TV show who also want to have the complete collection of the books in this series.